In the morning (7:00am) we will pick you up from your accommodation for the drive to the town of Cachora, and then on to Capuliyoc where we will have a panoramic view of the Apurimac valley and meet our horses and horsemen to begin our trek. The first day is majority downhill, we will stop in Chiquisqa for lunch before crossing over the river and heading uphill for a couple of hours to our camping spot for the night at Santa Rosa. Toilet and cold water shower available at the campsite. After breakfast, with fresh legs we will start a challenging climb uphill which then flattens out to a gentler climb to Maranpata (2850m), where we will be able to look back on how far we have come and appreciate the vegetation and views along the trail. We will have lunch at the campsite as long as we are making a steady pace. From this point it is only about an hour to the Choquequirao campsite where we will have lunch before a guided tour of the archaeological site and the recently uncovered llama wall on the other side of the site (please note your legs will be weary at the end of this day wandering around the steep site). Toilets and cold water shower available at the campsite. 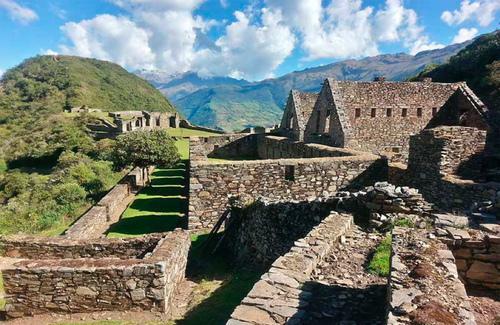 Option to visit Choquequirao again early to appreciate the sunrise and a little bit of free time at the site. After that we then descend to Santa Rosa where we will have lunch, and then Playa Rosalina. The last part of the day will be an ascent to the town of Chiquisqa where we will camp (toilet and cold water shower available). After a fortifying breakfast at 6:00am, we depart Chiquisqa and take the same path as we walked on day 1, until the passage of Capuliyoc and then another two hours to the town of Cachora which is a smoother stretch and we will arrive around midday. While walking we can appreciate the native flora and fauna and stunning views of snowcapped peaks and the impressive Apurimac canyon. We then drive back to the city of Cusco, arriving in the afternoon to your accommodation. Walking sticks / poles (rubber covers required).